Handsome boy, we are sending MASSIVE purrs that you feel better. Nous aussi, on croise les papattes et les doigts pour Milou. C’est toujours un déchirement de les laisser chez le véto, mais j’espère que cela portera ses fruits et que Milou ira vite mieux. Bon courage à vous et tenez-nous au courant. OMD we send healing paw and good vibes. We really hope Milou will be better soon. Our paws are crossed. Oh Texas my friend, me and Mom will be waiting for word…..in the meantime I’m purrrrrring for Milou from the bottom of my heart. Pauvre Milou ! #Solidarchat ! Plein de ronrons pour lui. Caresses de Miss Tigri. Nous croisons aussi les coussinets pour lui. We’re sorry to hear that Milou isn’t feeling well. Sending many purrs for him and for the worried humans, too. I am so incredibly sorry to hear this. Poor Milou and I simply hate to think of the worry and pain you are in at the moment. Holding thumbs, paws, tails and everything else we can grab. We are here for you. I know there is precious little we can do but our prayers and get well wishes are being sent over to you. We will be waiting for what we truly hope will be good news. Nous croisons doigts et coussinets. Et envoyons gros câlins. I am so sorry to hear that and hope he will get better soon. In case it helps I have been taught a very helpful trick to help sick and weak cats to eat, you need to make their food a little warm which emphasizes the good smell and stimulates their appetite. This trick has helped us and our furry children countless times. We’ll have to try this. Thank you! We’re purring and purring and sending lots of healing vibes to Milou! We will purrray that the vet is able figure out what’s wrong and get Milou back to his usual self. I’m sorry Milou is having such a hard time. We’re sending lots of healing energy his way! Healing purrs coming your way for Milou…so sorry he’s feeling poorly. Such a worry! Thank you so much for your wishes and kind words. I wanted to post a message on your bloggie but I couldn’t not find the comments. Maybe my human and I need a nap! Thank you furry much anyway! It makes me so sad, especially I think that the loss of Grouik was a great sorrow for Milou, and he still misses him. Hope that with your love and the vet’s care he will recover soon. This picture of him is very beautiful ! Big hugs to him and to you and Kitschka!! Thank you so furry much! So sorry to hear. Purrs and healing meows go y’all’s way. Keep us posted. Oh, no… this is so sad. I hope this is nothing more than a simple infection. Poor baby. I hope she is not scared to be away from home. Dear Milou, we are sending you special healing purrs; our paws are crossed for your speedy recovery. Sending purrs from me and prayers from Motor Mommy! On pense très fort à Milou et on croises nos doigts et pattounes pour lui. Oh dear, we are sending pawsitive thoughts to Milou. A cat that normally loves food and is not eating is never a good sign! Oh Milou…we’re very worried of him too…I hope he gets well soon…we send lots lots of purrrrrr for him from Japan! Thank you so furry much for your support! You are always there and we really appreciate! Sending purrs and healing thoughts and hope Milou is feeling well enough to eat very soon! We hope too! Thank you so much for stopping by and sending purrs and thoughts to Milou. We really appreciate! J’ai eu deux chats mâles castrés qui ont tousles deux eu le même problème. Les chats mâles castrés souffrent presque tous un jour ou l’autre de cela. Il faut alors donner une nourriture appropriée. Malheureusement pour Milou, il a ete plus que bien castre – ahem – et a aussi un regime alimentaire tres strict. Lui qui est si gourmand ! Merci en tout cas pour votre soutien ! I will truly be purring for him and Mommy said she will include him in her prayers. Love to Milou…lots of love. Such bad news! I keep my fingers crosses for Milou and hope he will getting better very soon. Purrs. He is a beautiful boy and I am sending hopes and prayers for him to be feeling better and to get well quick! Milou get yourself feeling better and get back home!!! Hope is nothing serious and that Milou goes back to his normal self soon. Thinking of you guys and sending loud purrs from Michigan. If there’s anything we can do to help, please let us know. We are all purring very hard for Milou! We are sending our very best healing purrs to Milou! Get well soon, dear. Of course dear Texas it goes w/out saying that we are purring for Milou very, very hard. Please get well soon, sweet one! Oh Milou, we sure send you tons and tons of purrs. We sure hope those vets can fix you up. We will be looking for the update. Positive energy coming from the residents cats here. They hate the vet! They don’t like sleeping there either. Poor kitty. Dear Milou, we are all sending you our very best purrs and prayers. We sure hope the all better finds you soon. Sending lots of positive healing energy to Milou.. lots of purrs from my four fur babies.. =^..^= Please let us know how he is doing. Hope it is just a UTI. DO you pee a lot Milou? They might want to check for diabetes or kidney disease. Our Minnie has IBD but we have not done a bio – we give her slippery elm and it helps soothe her tummy and intestines. Sending lots of purrs. From my Polish friend Roma: Trzymam kciuki i przytulam do serca!! (I cross my fingers and hold him tight close to my heart)! Please, say thank you from us! Sending lots of Woofie PawHugs. Feel better soon, Milou! dood…de blessings oh st francis two ewe..we noe onlee two well what cha be goin thru…N yur mom az well….sendin purrz til they be hurd in france and texas and bak again two ewe…heerz ta good mews, eatin trout N bein healthee again…nice ta see yur picture up front two…. Our purr machines are running on high. We hope Milou is better soon. We are sending you lots and lots of purrrrrrs for Milou.. We hope you get good news soon. Milou we have turned our purr motors up and they are working full time to try and make you feel better. Sending lots of very gentle head bonks. We are purring fur Milou furry hard. We purrs fur him’s family too, acause me know how hard it is to has a sick furrybaby. Oh No – purring good thoughts!!! Poor Milou. We are purring and praying super hard for him, and for you as you worry about him. Thank you so much for your sweet purrs. It worked! Thank you! We’re sorry Milou isn’t feeling well. We hope he will feel better soon. Purrs and pawtaps. Get better Milou!!! You hang in there, and take your medicines as you are supposed to! Sending purrs and prayers sent from all of us at Purrchance To Dream. Oh, Milou, we are all sending your our very best healing purrs. We all hope that it turns out to be something easily fixable. 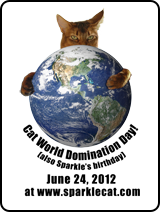 We saw this posted on the Cat Blogosphere, and came to offer our purrs and purrayers too. We hope Milou’s diagnosis will turn out to be (easily) treatable. Paws crossed. Vraiment sincèrement désolée. Mais je suis sure que tout va rentrer dans l’ordre. Il y a 6 ans une de mes minettes ne pesait plus que 1,9 kg et était mourante. Elle a vécu 5 ans de plus. Alors il a toujours de l’espoir. Plein de pensées positives et de ronrons de mes deux minettes pour Milou. We are sending tons of purrs for Milou to get better! Oh Dear! We is purraying furry hard for Milou and we is sending yous comforting and strength! I’m keeping my paws crossed and hoping Milou feels better soon. Thank you so furry much! This is very much appreciated! I am sending lots of purrs to Milou! I hope the vets come up with a good treatment for him! Sending loves,purrs and respects to dear Milou. STAY WELL GUY!! Purrs and prayers for Milu. Hugs for the humans. Get well soon pal. Sending love to Milou and family..
get well very soon my lovely Milou! you are my favourite one!! Aw, poor Milou! We’re praying and purring for him! Oh sweet Milou! We are purring for him in Nashville. Speedy recovery! Poor Milou! We will purray for him! We are purraying for Milou! We hope you get good news and the vets will set him right. Please keep us updated.. We’re purring for Milou’s loved ones too, cause we know how everyone suffers when a kitty is sick. Sending prayers for sweet Milu! sorry about your buddy. hope he makes a splashy come back. purrs. Poor kitteh. People worry about their cats so much when they won’t eat – it is definitely something to take seriously. Purr therapy from the Thunder household. We are sending lots and lots of purrs to Milou. Momma wanted to let you know that several years ago a Vet Momma now will not take me to, diagnosed me with IBS. Well Momma didn’t feel I had it. But I was terribly sick, wouldn’t eat, throwing up and it had been going on for days. Mom now knows it was her fault because she changed my foods, but that is another story, What she wanted to let you know was, she started me on organic slippery elm. She makes it into a liquid soup that she adds to my meals. She also adds organic milled flax seed and pumpkin to my food for my digestive issues. It works like a charm. But, the slippery elm has NO side effects, none. It has been used by American Indians for healing properties for centuries. Mom hated that the Vet prescribed prednisone (which was wrong for kitties) and that she made me take it for 2 days. We sure hope you are better Milou and hope that this magic works for you too. We are purring for Milou and hope he will be okay. Hoping for the best for you and Milou! Get well soon!